My husband and I collect minerals. One day while we were browsing in a rock shop we saw this cool old bottle full of crystals. Apparently someone had left a liquid in the bottle for too long and it evaporated, forming crystals. We though it was really neat but way too expensive so I decided to try to replicate it. We found a packet of crystal growing powder (available at places like Hobby Lobby) and an inexpensive bottle from an antique store. 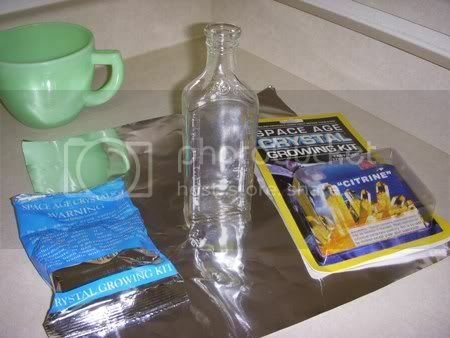 The crystal growing powder was fairly simple to use, though it is poisonous and requires use of the stove so adult supervision is needed. 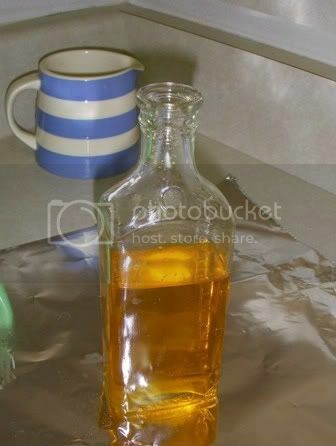 We mixed up the solution, poured it in the bottle and let it sit for several days. When we poured out the remaining solution, we had a nice blanket of crystals at the bottom. They were pretty small so we repeated the procedure a few times. I wish the crystals were different sizes; I'd like some longer ones mixed in with the short ones. 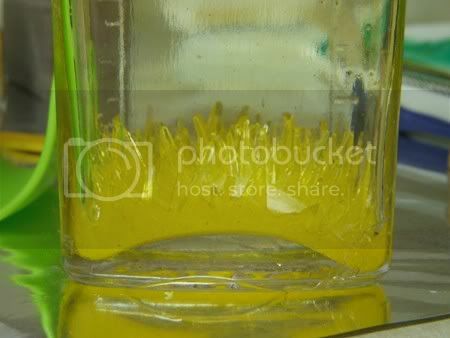 Actually, we accidentally grew some long crystals at the bottom of the pot we were using to store the extra solution. 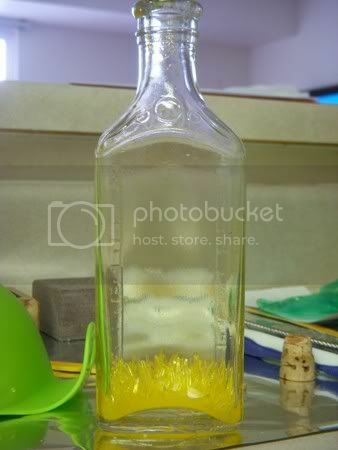 Maybe if we try again with a new bottle we can grow some long crystals in the pot first, then place them in the bottle and grow the short crystals around them. That looks really cool!Could you put different colors on top?? They do make the crystal powder in different colors, though I'm not sure if it would turn out well if we tried to layer them. Probably there would still be yellow at the bottom where it's thickest but all the crystals sticking up would just change to the new color and grow a bit bigger. I've also read that alum, which can be bought in the spice section at most grocery stores, can grow into neat crystals. I've bought some but haven't gotten around to trying it yet.